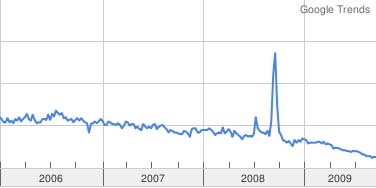 As this graph from Google Trends for the search term “washington mutual” shows, WaMu was in trouble long before the crisis of 2008. For what it’s worth, a Judge has ruled against JP Morgan Chases argument that he does not have jurisdiction in the case of Washington Mutual Inc (former owners of WaMu bank) vs JP Morgan Chase to recover some $4B in funds that WaMu Inc had deposited with WaMu bank. People who experienced a smooth transition from WaMu to Chase are in the Minority. Huge numbers of WaMu customers have left WaMu since 2007. There is still an overall outflow of WaMu customers now (more leaving then joining). The largest number of people still planning on leaving their bank (of any bank) are Chase customers. Former WaMu customers still identify themselves as WaMu customers, not Chase customers. The largest number of customers leaving WaMu headed for a credit union, followed by Wells Fargo. Here is one angry homeowner that posted a video extolling the depths of her frustrations with Chase’s loan modification program. While the video is rather funny, it is typical of the frustrations that people are having with Chase’s loan modifications. Happy one year anniversary of your seizure by the FDIC and sale to JP Morgan Chase WaMu! Here is another blog dedicated to Chase’s home finance unit sucking. I recently checked our web logs and discovered that we’ve had 473 pageviews from chase.com IP addresses over the last 12 months. I can only hope they are learning something from all the complaints posted here. Chase, for the record, I’d like nothing more than for you to become a better bank. We need some stand up banks in this country.